" I did what I was told to do, as well as I could. There would be no Finland unless everyone else had done the same" Simo Häyhä. We have had a number of books and movies recently about the exploits of snipers. None of the others even come close to Simo Häyhä. His record of 542 confirmed kills is head and shoulders above the rest, mainly because he used his own M28-30 rifle with only iron sites. If given a fifty caliber sniper rifle and a state of the art scope, he might have been able to shoot out Stalin's left eye from the Finnish border. The other fact that makes his kill record unbelievable is the fact that he was only in action ninety-eight days during the Russo-Finnish or Winter war. His daily average of kills was an astonishing 5.53. All of these facts are simply amazing. As the book points out, an American study found that 7,000 rifle shots were needed in WWI to achieve a combat kill. During the Vietnam War, this had risen to 25,000. Compare this to a professionally trained sniper who needs just 1.3 shots for a kill. Finland is one of those European countries that we take for granted. Oh sure, we know where it is on a map, but the country's history, and especially its military history, is a blank page to many. Finland, much like Switzerland, is a country that no one thinks of when military ardor is thought of. The truth is the Swiss were the greatest mercenaries for a few hundred years of European history. Finland's martial history, while not as far reaching as the Swiss, is just as decorated either fighting for or against Swedish kings or Russian czars. The Winter War was Stalin's attempt to emulate Hitler. Stalin wanted to take some land from Finland, and he made sure the Finns understood "it was an offer they couldn't refuse". Much to Stalin's delight the Finns did refuse. So now Uncle Joe could show the world what the Red Army could do. The Russian bear attacked Finland assuming that after some fighting and a little objection from the free world, the Finns would roll over and play dead. Well, Finland showed what the Red Army could do; it could bleed, and profusely at that. Finland's heroic fight against its titanic neighbor was the center of the worlds attention in the winter of 1939. The British government was actually considering attacking the Soviet Union over the aggression. Imagine how different WWII could have been if that happened. All eyes were glued on plucky little Finland. In the end Russia won, of course, but the Red Army's dismal performance was one of the reasons that Hitler turned his rapacious eyes to the east. So now that we have some background information we turn back to second lieutenant Häyhä. He was born on December 17, 1905. Unfortunately, he did not make it to one hundred years, dying on April 1, 2002 (if you weren't aware the Finns are a long lived race). He was conscripted into the Finnish Army in late 1925 and served fifteen months in different bicycle battalions. He then served a few weeks in the summer of 1938 and underwent sniper training. He was in Finland's civil Guard when his marksmanship came to his superiors' attention. He won numerous awards and championships with both a rifle and a machine gun. He was a hunter and trapper from childhood in Finland's vast forests. This he put to good use in the war. The Russians tried to kill him several times and even put a price on his head. Häyhä's luck ran out on March 6, 1940. He was hit in the face and head with an exploding bullet. The Winter War would have been over in just a few more days. He had to undergo twenty-six operations through his life due to the wound; the left side of his jaw was missing. He did go onto live a long and productive life as a farmer and continued his hunting for many years. The book's author is a career officer in the Finnish Army. His expertise is in sniping and he has taught the skill for two decades to the new breed of Finnish warriors. 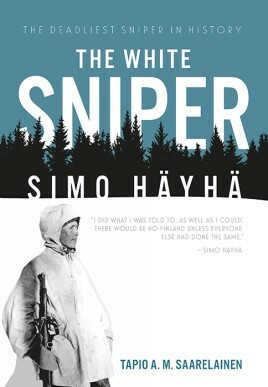 The first part of the book is devoted to the life of Simo Häyhä, before and after the war. The second half goes into the secrets of Häyhä's success, his rifle, and using his techniques. The appendices are four in number and include a list of the top snipers in the world from 1939 to 2005. The book is what we have come to expect from Casemate. It is well made and is liberally supplied with photos, maps, and some diagrams. A question to the readers, what is a Molotov cocktail? its the WHITE DEATHHHHHHHHH NOT THE WHITE MAN!